11.6" Ultrabook convertible runs Windows 8 and is now available starting at $799. Back at CES earlier this year, Lenovo unveiled a pair of convertible Ultrabooks, the IdeaPad Yoga and Helix, and one of them is now being released. 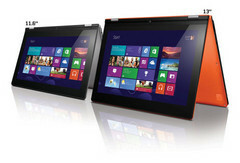 The IdeaPad Yoga 11S has now been made available for purchase, and can be ordered through Lenovo and Best Buy. Featuring an 11.6", touchscreen display, the Yoga 11S features the same 360-degree swivel hinge as its predecessor, the Yoga 11, but does without the NVIDIA Tegra 3 CPU. Instead the Ultrabook packs Intel's Core series of processors, with i3, i5 and i7 options available, all while weighing just 1.4 KG. Other feature on the 11S include up to 8GB of RAM, up to a 256GB SSD, a battery life of up to 6 hours and Intel HD 4000 graphics. The swivel design employed by Lenovo has proven to be quite popular and the company hopes that popularity extends to include their new Yoga 11S. Starting at just $799, the notebook can be ordered today (albeit with a 4 week shipping time) and will be available in retail Best Buy stores on the 23rd of June.